Bill and his roundtable guests - Rep. Adam Schiff, Grover Norquist, Zerlina Maxwell, John Avlon & Bob Costas - will answer viewer questions after Friday's show. Submit your questions in the comments section below. Selected questions will be answered on the Real Time Youtube Channel immediately following the premiere. Please be aware that concise (50 words or less) single-topic questions have the best chance of being selected, so the shorter and more specific you can be, the better. On Fox News Sunday, Bill Hemmer asked Mick Mulvaney if we’re ever going to see Trump’s tax returns. “Oh no, never,” was his reply. At least you have to give him credit for not jerking us around with nonsense about an audit or “I’ll get back to you; we’re looking into it very strongly." Bill Maher shares a few fun "facts" about Vice President Mike Pence. 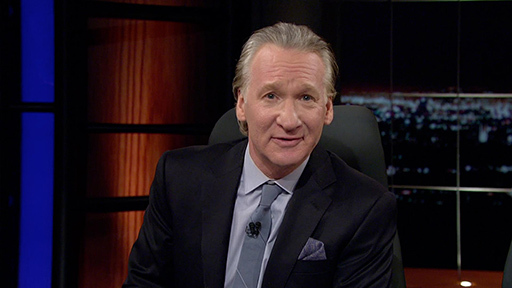 Curatorial journalist and "Proof of Collusion" author Seth Abramson joins Bill Maher to discuss President Trump's shady behavior. Bill recaps the top stories of the week, including Attorney General William Barr's congressional obfuscation and President Trump's latest attacks on immigrants. Every day I see a new article on something millennials aren’t buying: Cars. Homes. Cereal. Soda. Designer clothes. Cable TV. Weddings. For a party that prides itself on its racial and cultural diversity, why do the Democrats allow the first two most important presidential contests to be held in Iowa and New Hampshire? Bill and his guests answer viewer questions after the show. Author and comedian Chelsea Handler joins Bill to discuss her new memoir, "Life Will Be the Death of Me...and you too!" Bill recaps the top stories of the week, including pushback on the Mueller report and Joe Biden's touchy-feely transgressions. Julián Castro is former United States Secretary of Housing and Urban Development under President Obama and former Mayor of San Antonio, Texas. He is a candidate for the 2020 Democratic Presidential nomination and recently unveiled a detailed plan to revamp America’s immigration system. Bill and his roundtable guests - Sec. Julián Castro, Chelsea Handler, Salman Rushdie, Danielle Pletka & Gideon Rose - will answer viewer questions after Friday's show. A wise man once said, “Trade wars are good and easy to win.” No, wait, let me check my notes, it was a total dumbass. Here’s another entry for my Dictator Checklist: creating preposterous myths about yourself. In his editorial New Rule, Bill argues that socialism can work wonders when used as a supplement to capitalism.